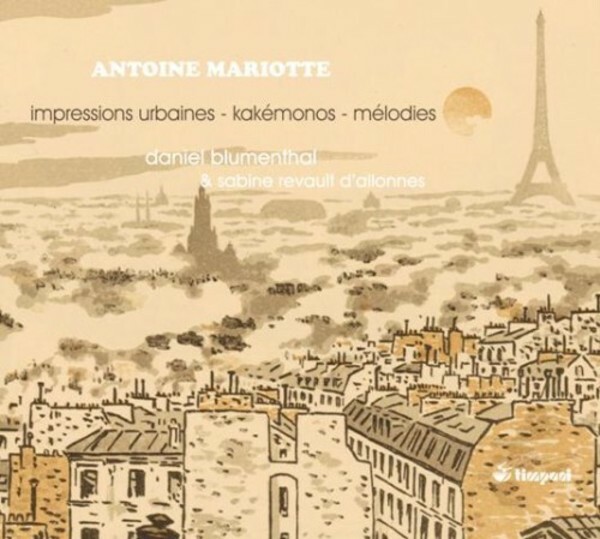 Antoine Mariotte: not only the composer of a Strauss-rivalling Salomé that was revived by the Montpellier Festival, but also of a piano cycle, Impressions urbaines, reputed to be on the outer edges of the playable and far indeed from the salon pieces one might have imagined. Though the title refers to impressionism, the style is of uncommon expressionist violence, thoroughly suitable for portraying a harsh human-crushing environment: Usine (Factory) – Faubourgs (Suburbs) – Guinguettes (Dance cafés) – Décombres (Rubble) – Gares (Railway stations). This is great piano writing that heralds Prokofiev and has intimidated more than one performer! The Kakémonos, 4 ‘Japanese’ pieces for piano, are in the same manner though with a lighter touch, while the Songs, with, all in all, some complex harmonies that remind one of Duparc, afford a moment of relaxation. All these pieces are world premiere recordings and benefit from the exemplary virtuosity of Daniel Blumenthal, who had performed the Impressions urbaines nearly 25 years ago in Paris! And Sabine Revault d’Allonnes was hailed by the press on the occasion of her discs of songs by Massenet and Pierné.